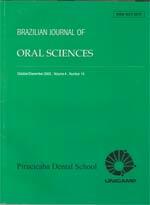 Aim: To evaluate the prevalence and hygiene habits of 13-19 years-old adolescent users of removable orthodontic appliances (ROA) and to determine hygiene methods for the appliances prescribed by dentists, in the city of Pelotas. Methods: The study had two stages. The first stage was a telephone interview with dentists. Dentists were interview by telephone calls in order to obtain information regarding the hygiene methods for cleaning acrylic appliances. Second stage was a cross-sectional study performed with schoolchildren. Children from public and private schools with secondary level were included in the sample. A questionnaire was applied to the students using any type of ROA. Questionnaires included demographic information and behavioral characteristics. Data collected were subjected to Chi-square test and logistic regression. Results: The prevalence of children using ROA was 5.4%. Students (89.7%) and dentists (47.2%) reported to prefer mechanical methods to clean their ROA. Cleaning with soup, hydrogen peroxide or effervescent tabs were less used. High frequency of use was associated with higher frequency of hygiene on the ROA. Conclusions: The prevalence of schoolchildren using removable appliances was low. The common cleaning method used by children and prescribed by dentists was mechanical. Hygiene frequency was significantly associated with the routine of use of the appliance and with the type of hygiene method.